(August 1, 2016) - The Portland Bureau of Transportation (PBOT) will reopen SW Broadway Drive on August 2, in time for the morning commute. The street, which was originally scheduled to be closed through the end of August, has been closed to all motor vehicles since June 21st for the replacement of a failing retaining wall. Through August, crews will continue additional work at the site that does not require the road to be closed. The traveling public is advised to expect delays while repairs are being made. We ask the public to travel cautiously through work zones, observe all lane closures and directions by reader boards, and use alternate routes if possible. 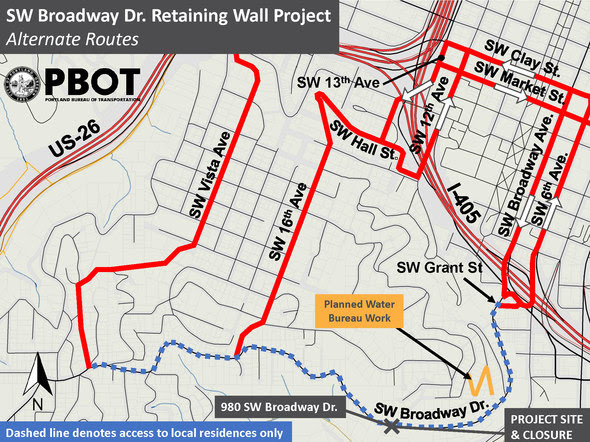 (June 20, 2016) – The Portland Bureau of Transportation advises the traveling public that replacement of a distressed rubble retaining wall on a portion of SW Broadway Drive will require a full road closure for all motorized vehicle traffic beginning tomorrow, June 21, 2016, for the project’s entire duration through August 2016. 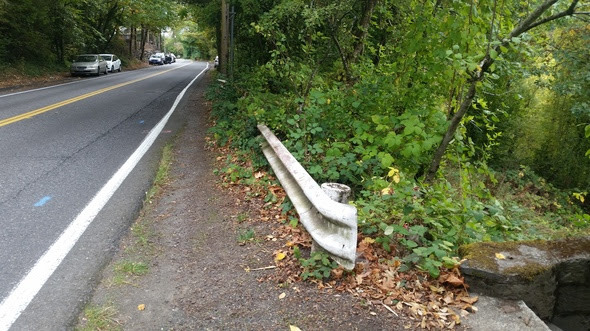 The goal of the project is to replace a distressed rubble retaining wall that supports a small portion of SW Broadway Drive and an important water line. The existing wall will be replaced by a new one supported on deep foundations and designed for resilience to earthquakes and landslides. Concurrent with the retaining wall work, PBOT will also make guardrail improvements in the project vicinity. The current rubble wall on SW Broadway Drive is covered in vegetation and is not resilient to earthquakes and landslides. SW Broadway Drive between SW Grant Street and SW Vista Avenue will be closed to motorized vehicle traffic all hours and all days during the project duration. The roadway will remain open to local traffic only, up to the complete "hard" closure at the work zone. The closure will be approximately 350 feet long, near the property address 980 SW Broadway Drive. Motor vehicles will need to use alternate routes around the road closure. SW Broadway Drive closure and alternate routes. Pedestrian and bicycle access through the site will be maintained. A pedestrian and bicycle corridor will be provided along the north shoulder of the road through the project area. For more information, see the project web site.